Llandras Belaal is a Dunmer sorcerer living in Balmora. At night, Llandras will be holding a torch and will come up to you preaching about the Sixth House and Dagoth Ur. He is a Sleeper agent, someone under the influence of Dagoth Ur. 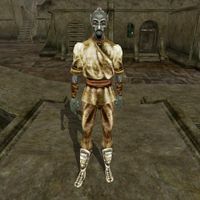 If you are not a Dunmer, and talk with him about the Sixth House his disposition will drop and he may attack you if his disposition becomes too low. When you kill Dagoth Fovon in Hassour, or destroy Dagoth Ur, the spell on Llandras will be lifted and he will thank you for saving him, resulting in a 1 point of Reputation increase. He wears a common shirt with matching pants, cloth bracers, and chitin boots. He carries a steel dagger, a long bow with 100 iron arrows, three large kwama eggs, a saltrice, a marshmerrow, a kwama cuttle, a torch, an apprentice's armorer's hammer and 236 drakes. Aside from his natural resistance to fire and the sanctuary provided by his ancestors, he knows the following spells: Test Spell and Fireball.